9:19 p.m. Mark Anthony Ornelas, 51, Laguna Woods, was arrested for violating parole. No bail was set. 8:17 p.m. Clare Elizabeth Whitaker, 46, San Bernardino, was arrested on two undisclosed warrants (bail was set at $25,000 for both). 3:46 p.m. A 47-year-old Garden Grove woman was arrested on suspicion of DUI (bail was set at $2,500) and driving with a blood alcohol content of 0.08% or higher (bail was set at $2,500). 2:22 p.m. LBPD received a report in reference to a lizard stuck inside of the caller’s house. 12:21 p.m. Maxwell Carlton Post, 28, Laguna Beach, was arrested for violating parole (no bail was set) and for making annoying telephone call(s) that were obscene/threatening (bail was set at $1,000). 1:34 p.m. LBPD received a report in reference to a dead snake. According to police reports, the caller requested an Animal Services Officer come out to verify the type of snake it was. 1:24 p.m. LBPD received a report in reference to a possible rattlesnake in the front yard near the caller’s mailbox. It turned out to be a large gopher snake and was permitted to remain on the property. 7:02 a.m. Alan Michael Harrison, 34, Laguna Hills, was arrested on a warrant for lodging in a public place. Bail was set at $2,500. 1:07 a.m. A 43-year-old Irvine man was arrested on suspicion of DUI. Bail was set at $2,500. 1:04 a.m. A 30-year-old Santa Ana man was arrested on suspicion of DUI (bail was set at $2,500) and driving with a blood alcohol content of 0.08% or higher (bail was set at $2,500). 12:19 a.m. A 23-year-old Ladera Ranch woman was arrested on suspicion of DUI. Bail was set at $2,500. 9:22 p.m. Feinai Saipani Eli, 44, Laguna Beach, was arrested for trespassing (no bail was set) and for possession of controlled substance paraphernalia (no bail was set). 2:16 p.m. LBPD received a report in reference to “an injured sea lion on the beach at Shaw’s Cove with barbed wire around it.” According to the report, the sea lion was three feet in length and weighed approximately 50 pounds. PMMC was called and enroute to rescue the sea lion. 12:46 p.m. LBPD received a report in reference to an unknown snake on the right side of the caller’s driveway in the grass, along the bushes. The RP requested it be removed. 7:54 a.m. LBPD received a report regarding a sick sea lion. PMMC went on scene and rescued the sea lion. 7:04 a.m. LBPD received a report in reference to a sick seal on the beach. “People are trying to take pictures with it. The seal is not friendly,” reads the report. PMMC responded to the scene and took in the seal. 12:11 a.m. Jovanny Nava, 21, Aliso Viejo, was arrested on a warrant for speeding. Bail was set at $1,500. 12:09 a.m. Jerald Jerrod Cousian, 51, Laguna Beach, was arrested for possession of controlled substance paraphernalia. No bail was set. 10:42 p.m. Andrew James Eastin, 30, Costa Mesa, was arrested for taking a vehicle without owner consent (bail was set at $20,000) and for possession of controlled substance paraphernalia (bail was set at $500). 9:58 p.m. Leonard Gonzalez, 37, Long Beach, was arrested for taking a vehicle without owner consent (bail was set at $20,000) and for possession of burglary tools (bail was set at $500). 9:22 p.m. A 46-year-old Laguna Beach man was arrested for disorderly conduct related to alcohol. Bail was set at $500. 9:35 p.m. A 46-year-old Laguna Beach man was arrested for disorderly conduct related to alcohol. Bail was set at $500. 9:21 p.m. A 52-year-old Laguna Beach man was arrested on suspicion of DUI. Bail was set at $2,500. 10:58 p.m. A 37-year-old Irvine woman was arrested on suspicion of DUI. Bail was set at $2,500. 7:29 p.m. A 27-year-old Costa Mesa man was arrested for disorderly conduct related to alcohol. Bail was set at $500. 9:45 a.m. Moises Rodrigo Castrorodriguez, 32, Huntington Beach, was arrested on an undisclosed warrant. Bail was set at $30,000. 4:49 a.m. Konrad Hanes Peikar, 28, Laguna Niguel, was arrested for being under the influence of a controlled substance. Bail was set at $500. 1:27 a.m. A 47-year-old Henderson, NV woman was arrested on suspicion of DUI (bail was set at $2,500) and driving with a blood alcohol content of 0.08% or higher (bail was set at $2,500). Pacific Marine Mammal Center (PMMC) reported a record 12 pinniped rescues from Friday, April 12 to Monday, April 15, with six rescues on Friday alone. The first rescue, at 7:04 a.m. on Friday, April 12, was an elephant seal pup at the 1300 block of Circle Way. The female seal, named Moscow, was rescued and brought back to PMMC. The seal was malnourished and dehydrated and is now resting at PMMC. The second case PMMC looked into, at 7:54 a.m., turned out to be an adult female sea lion at Thalia Street Beach. Since these animals are partially aquatic, sometimes they rest on non-crowded beaches. Because it was the early morning, not many people were at the beach yet. “PMMC went out to investigate and determined the animal did not need to be rescued and encouraged it back into the water as to not get harassed by pets and people,” PMMC’s Krysta Higuchi said. The third rescue on Friday occurred at Shaw’s Cove at 2:46 p.m. following reports of a pinniped with a neck injury. “This would be the fourth out of six rescues we would perform that day. When we first got the call, our team was already out on two other rescues,” Higuchi said. The PMMC team was able to pick up the animal and bring back it to PMMC. Once back at the center, a full exam was performed and it was determined a ratfish barb was in the elephant seal pup’s neck. “Our animal care team was able to remove the 4-inch barb. The animal has other wounds; a full X-ray and other exams will be performed to determine the full extent of the animal’s injuries,” Higuchi said. Unfortunately, PMMC is also still without Internet and phones, which went out after a car hit a pole on Saturday night near PMMC. All phone calls to PMMC’s main line are being rerouted to a cell phone. To contact PMMC or report an injured pinniped, please call (949) 494-3050. To make a donation to PMMC, visit www.pacificmmc.org. On Monday, April 15, at 7:55 a.m., LBPD officers responded to South Coast Highway and Anita Street for a vehicle versus motorcycle traffic collision involving two local residents. The motorcycle rider, 55-year-old Laguna Beach resident Scott Thompson, sustained major injuries, according to Sgt. Cota. The driver of the Mercedes-Benz is an 82-year-old Laguna Beach resident. Thompson, owner of Sweetwater Car Wash, remains in critical but stable condition, according to Sgt. Cota. On Saturday, April 13, at 8:17 p.m., LBPD officers responded to a report of a possible residential burglary in progress at the 1100 block of N Coast Hwy. According to police reports, a neighbor called to report that she saw someone enter her neighbor’s backhouse, after seeing the lights go on and off. According to Sgt. Jim Cota, LBPD officers arrived and observed two subjects inside of the residence. Clare Elizabeth Whitaker, 46, of San Bernardino, and Mark Anthony Ornelas, 51, of Laguna Woods, were both arrested for violation of burglary, according to Sgt. Cota. Whitaker was found to have an outstanding warrant and Ornelas was found to be on parole for previous arrests and convictions of burglary. Both subjects have no fixed address, according to Sgt. Cota. Bail was set at $25,250 for Whitaker. No bail was set for Ornelas. On Thursday, April 11, at 9:59 p.m., LBPD officers were advised of a stolen vehicle from Newport Beach PD. According to police records, the stolen vehicle was a white 2016 Ford Fusion. The car was reportedly unlocked and the keys left inside the vehicle. Andrew James Eastin, 30, of Costa Mesa, and Leonard Gonzalez, 37, of Long Beach, were arrested for possession of a stolen vehicle, possession of narcotic paraphernalia, and possession of burglary tools. Bail was set at $25,000 for both Eastin and Gonzalez. On Saturday, April 13, at 6:24 p.m., LBPD officers were dispatched, along with LBFD, to a cut and rescue traffic collision at the 20600 block of Laguna Canyon Road, near Pacific Marine Mammal Center. A traffic alert was sent out due to traffic being reduced to one lane for approximately 45 minutes. Edison arrived on scene and secured their portion of the wires. The pole belonged to Verizon, according to Sgt. Cota. On Saturday, April 13, at 12:21 p.m., 28-year-old Laguna Beach resident Maxwell Carlton Post allegedly began calling dispatch and making lewd comments and inappropriate requests to the dispatchers over the phone. Officers responded to Post’s residence and arrested him for making annoying/obscene telephone calls and the parole hold. On Monday, April 8, at 8:20 p.m., LBPD officers responded to the Bus Depot, at the 300 block of Broadway Street, in reference to a male subject allegedly peeping in the women’s restroom. Rogelio Molohua, 31, Laguna Beach, was arrested for violation of peeping and public intoxication. Bail was set at $1,000. On Tuesday, April 9, at 9:50 a.m., dispatch advised LBPD officers of a stolen vehicle heading northbound on South Coast Highway from Nyes Street. The vehicle was a Cadillac Escalade recently stolen from the City of Costa Mesa. Gary Michael Archuleta, 55, of Laguna Hills, was arrested for being in possession of a stolen vehicle and being in possession of burglary tools. He was booked and transported to OC Jail. A Laguna Beach High School lacrosse coach was arrested on Tuesday, April 8 on suspicion of inappropriately touching female students, according to LBPD Spokesperson PIO Sgt Jim Cota. Three female student athletes reported that Robert Sant, head coach of the girls’ lacrosse team, had inappropriately touched them in non-intimate areas of their bodies, the department said. “On Friday, April 5 at 1 p.m., School Resource Officer (SRO) Cornelius Ashton was advised by two female LBHS students that their LBHS lacrosse coach, Robert Stewart Sant, Irvine resident, inappropriately touched them in non-intimate areas on their bodies. The most recent [alleged] incident happened on a school bus on April 4 on the way home from a lacrosse game. SRO Ashton’s investigation led to a third female victim who was interviewed. LBUSD leadership was notified and took appropriate action,” Sgt Cota said. Sant, who was in his first season as head coach of the team, is no longer an employee of LBUSD. “He is no longer an employee of LBUSD as of April 5. The District is cooperating with law enforcement in their investigation,” said Leisa Winston, LBUSD Assistant Superintendent, Human Resources and Public Communications. On Tuesday, April 9 at 1:07 p.m., SRO Ashton and LBPD detectives responded to the city of Irvine and arrested 37-year-old Robert Stewart Sant on suspicion of three counts of Lewd & Lascivious Acts with a Child. Bail was set at $100,000, which Sant posted, according to Sgt Cota. “This investigation is still ongoing,” Sgt Cota said. 5:54 p.m. Konrad Hanes Peikar, 28, Laguna Niguel, was arrested for being under the influence of a controlled substance. Bail was set at $500. 3:57 p.m. LBPD received a report in reference to a rattlesnake. According to police records, a caller reported seeing a rattlesnake near the entry of their home. They called to see if Animal Services would do a welfare check for the snake because, according to the report, it looked like the tail of the snake was damaged. 3:21 p.m. Kyle Albert Winton, 39, Laguna Beach, was arrested on two warrants for disorderly conduct related to alcohol (bail was set at $10,000 for each) and for disorderly conduct related to alcohol (bail was set at $500). 1:07 p.m. Robert Stewart Sant, 37, Irvine, was arrested on suspicion of committing a lewd and lascivious act with a minor (three counts). Bail was set at $100,000. 9:50 a.m. Gary Michael Archuleta, 55, Laguna Hills, was arrested for being in possession of burglary tools (bail was set at $500) and for being in possession of a stolen vehicle/vessel (bail was set at $20,000). 9 a.m. Daniel Paul Schneider, 53, Laguna Beach, was arrested for two undisclosed warrants. Bail was set at $1,500 and $2,500. 8:15 p.m. LBPD received a report in reference to an alleged LBMC violation. According to police records, a caller reported that at the Camel Point Beach access there was “a substantial fire and subjects were throwing firewood.” LBPD went to the scene and contacted the four subjects. 8 p.m. Rogelio Molohua-Molohua, 31, Laguna Beach, was arrested for a warrant for disorderly conduct related to alcohol (bail was set at $500) and for loitering (bail was set at $500). 6:14 p.m. LBPD received a report in reference to a subject defrauding an innkeeper. According to police records, a caller reported that a male had skipped out on his bill. The approximate loss was $400. A WhatsApp notification was sent out. 6:14 p.m. LBPD received a report in reference to a rattlesnake. According to police records, a caller reported seeing “a large rattlesnake in their front lawn moving around.” Later, the snake was reported to be gone. 8:45 p.m. Laura Lynn Vinyard, 51, Fullerton, was arrested on a warrant for being drunk in public. Bail was set at $2,500. 7:24 p.m. Jorge Antonio Zepedanarvaez, 27, Los Angeles, was arrested for being in possession of a controlled substance (bail was set at $500) and driving with a suspended license (bail was set at $500). 2:43 a.m. Jonathan David Begay, 30, Laguna Beach, was arrested on suspicion of DUI with one prior. Bail was set at $10,000. 1:18 a.m. A 41-year-old Irvine man was arrested on suspicion of DUI (bail was set at $2,500) and driving with a blood alcohol content of 0.08% or higher (bail was set at $2,500). 12:21 a.m. A 39-year-old Laguna Beach man was arrested on suspicion of DUI (bail was set at $2,500) and driving with a blood alcohol content of 0.08% or higher (bail was set at $2,500). 12:02 a.m. A 47-year-old Huntington Beach woman was arrested on suspicion of DUI (bail was set at $2,500) and driving with a blood alcohol content of 0.08% or higher (bail was set at $2,500). 10:54 p.m. Christopher Ryan Haro, 37, Santa Ana, was arrested on an undisclosed warrant. Bail was set at $2,500. 2:34 p.m. LBPD received a report in reference to a live bat. According to police records, the caller reported that there was a live bat in his home. It turned out to be a moth. 12:59 p.m. Kyle Albert Winton, 39, Laguna Beach, was arrested for resisting arrest (bail was set at $500) and trespassing (bail was set at $500). 2:03 p.m. LBPD received a report in reference to a sick sea lion. According to police records, the caller found a sea lion on the beach that appeared to be “struggling.” The sea lion was located just north of the stairs. 10:48 a.m. A 46-year-old Laguna Beach man was arrested for disorderly conduct related to alcohol. Bail was set at $500. 3:34 a.m. A 25-year-old San Juan Capistrano woman was arrested on suspicion of DUI (bail was set at $2,500) and driving with a blood alcohol content of 0.08% or higher (bail was set at $2,500). 2:57 a.m. A 19-year-old Orange man was arrested on suspicion of DUI (bail was set at $2,500) and driving with a blood alcohol content of 0.08% or higher (bail was set at $2,500). 1:43 a.m. Jonathan Avila Barron, 20, Lynwood, was arrested for possession of a controlled narcotic substance. Bail was set at $500. 1:31 a.m. A 28-year-old Laguna Beach woman was arrested on suspicion of DUI (bail was set at $2,500) and driving with a blood alcohol content of 0.08% or higher (bail was set at $2,500). 12:13 a.m. A 25-year-old Laguna Niguel woman was arrested on suspicion of DUI (bail was set at $2,500) and driving with a blood alcohol content of 0.08% or higher (bail was set at $2,500). 10:02 p.m. A 62-year-old Laguna Beach man was arrested on suspicion of DUI. Bail was set at $2,500. 9:50 p.m. LBPD received a report regarding fireworks at the beach. According to police records, the caller reported that a group of young kids were lighting M80 fireworks at the beach. LBPD went to the location and the teens were gone on arrival. 1:47 p.m. Brian Kieth OConnor, 56, Laguna Beach, was arrested on an undisclosed warrant. Bail was set at $10,000. 7:59 a.m. Miriam L Gonzalez Orozco, 26, Bell Gardens, was arrested for possession of a controlled substance. Bail was set at $500. 7:01 a.m. Terry Dwayne Sanders, 44, Laguna Beach, was arrested for resisting arrest. Bail was set at $500. 10:07 p.m. Jacob Edward Gildart Matany, 29, Santa Ana, was arrested on a flash incarceration (no bail was set), resisting arrest (bail was set at $500), and vandalism (bail was set at $500). 7:39 p.m. Matthew Peter Rogers, 61, Los Angeles, was arrested for resisting arrest (bail was set at $500) and trespassing (bail was set at $500). 2:03 p.m. LBPD received a report in reference to three males in their teens smoking marijuana on the trails. 1:51 p.m. Gary Wayne Horton, 73, Laguna Beach, was arrested on an undisclosed warrant. Bail was set at $10,000. 4:58 a.m. Hector Sanchez, 29, San Diego, was arrested for vandalism of less than $400. Bail was set at $500. 2:31 a.m. Gordon Lawrence Weider, 71, Laguna Beach, was arrested on a warrant for being drunk in public (bail was set at $10,000) and on a second warrant for being drunk in public (bail was set at $10,000). 12:31 p.m. A 53-year-old woman from Van Horne, IA was arrested on suspicion of DUI (bail was set at $2,500) and driving with a blood alcohol content of 0.08% or higher (bail was set at $2,500). 3:55 p.m. A 53-year-old Dana Point man was arrested for disorderly conduct related to alcohol. Bail was set at $500. 5:48 p.m. A 37-year-old Laguna Beach man was arrested for disorderly conduct related to alcohol. Bail was set at $500. 2:25 p.m. A 56-year-old Laguna Beach man was arrested for disorderly conduct related to alcohol. Bail was set at $500. 2:10 p.m. A 37-year-old Laguna Beach man was arrested for disorderly conduct related to alcohol. Bail was set at $500. 2:03 p.m. LBPD received a report in reference to a baby seal. According to police records, the caller stated they found a baby seal on the sand during low tide. Animal Services went to the location, found the seal deceased, and removed it from the beach. 12:43 p.m. A 46-year-old Laguna Beach man was arrested for disorderly conduct related to alcohol. Bail was set at $500. 12:36 p.m. A 26-year-old Laguna Beach man was arrested for disorderly conduct related to alcohol. Bail was set at $500. 10:38 a.m. Jeffery Joseph Noon, 64, Laguna Beach, was arrested for trespassing. Bail was set at $500. 7:20 a.m. Reese Mitchel Westenberger, 53, Lake Forest, was arrested on an undisclosed warrant. Bail was set at $7,500. 3:45 a.m. Brian Douglas Ricker, 39, Merritt island, FL, was arrested on an undisclosed warrant. No bail was set. “The residents believe she may be casing the area,” LBPD PIO Sgt Jim Cota said. The incident could be what is being called “flocking,” a new burglary tactic targeting affluent neighborhoods that seems to be on the rise. Over the last couple of years, celebrities, singers, and athletes in Los Angeles have experienced being flocked such as actor Emmy Rossum, singer Alanis Morissette, and former LA Dodger Yasiel Puig, who now plays for the Cincinnati Reds. Victims have reported losses ranging from $150,000 to $2 million. Now it seems that some flockers have migrated south to Laguna Beach. Remember to just say “no” to strangers. Always put safety first and call LBPD at (949) 497-0701 if you believe you have been flocked or have seen suspicious flockers in your neighborhood. On Saturday, March 30, at 11:39 p.m., LBPD received a report in reference to kids ringing a man’s doorbell and knocking on his window. According to police reports, the caller stated that kids ran up ringing his doorbell three times and banged on the window. Approximately six kids, all boys between ages 11 and 14 years old, were reported. The incident occurred about 35 minutes prior to the report. Then, on Wednesday, April 3, at 6:59 p.m., another occurrence of kids playing ding dong ditch was reported in town. 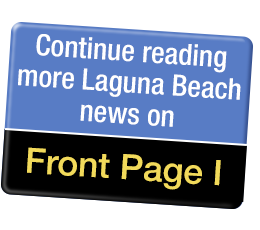 On Friday, April 5, at 10:05 p.m., at the 300 block of S Coast Highway, LBPD responded to a call in reference to someone yelling underneath the boardwalk. According to witness reports, a male was underneath the boardwalk yelling obscenities, repeatedly “dunking” in and out of the water and refusing to come out. According to Sgt Cota, "Officers made contact with the subject, who required paramedics for possible hypothermia. The subject was ultimately transported to Mission Hospital Laguna Beach for medical treatment." 3:26 p.m. LBPD received a report in reference to juveniles playing “Senior Assassin.” It was reported that two females in a gray VW Wagon were driving around speeding in the street. One male was reportedly running on the street with a water gun. 3:13 p.m. Alan Dean Fabian, 64, Hacienda Heights, was arrested on an undisclosed warrant. Bail was set at $50,000. 2:49 p.m. LBPD received a report regarding a rattlesnake. According to police records, a baby rattlesnake was found near the caller’s gate in their driveway. The snake was reportedly taken into custody and relocated. 1:02 p.m. Ralph Francis Bowers, 48, Huntington Beach, was arrested for trespassing (bail was set at $500) and violating parole (no bail was set). 12:36 p.m. Edward Patrick Schillizzi, 63, Long Beach, was arrested on a warrant for trespassing. Bail was set at $50,000. 4 p.m. LBPD received a report regarding a rattlesnake. According to police records, a resident stated there was a rattlesnake at the bottom of the steps to her residence. The woman called requesting assistance from Animal Control. Feinai Saipani Eli, 44, Laguna Beach, was arrested for being in possession of a controlled substance. Bail was set at $500. 6:17 p.m. Marc Anthony Trotter, 49, Los Angeles, was arrested for being in possession of a controlled substance (bail was set at $500), possession of a controlled narcotic substance (bail was set at $2,500), and on a warrant for possession of methamphetamine (bail was set at $3,500). 12:13 p.m. LBPD received a report regarding a rattlesnake. According to police records, the rattlesnake was in the caller’s backyard. 1:18 a.m. Ryan Michael Connor, 28, San Diego, was arrested for domestic violence with minor injury. Bail was set at $50,000. 9:56 a.m. LBPD received a report in reference to a rattlesnake. According to police records, there was a baby rattlesnake in the middle of the street, not moving at all. The caller was unsure if it was dead or alive. The RP stated she would be standing by with her dog until Animal Services arrived. 5:42 p.m. LBPD received a report in reference to grand theft. According to police reports, a kayak was stolen, estimated to be worth $1,000. 4:19 p.m. LBPD received a report in reference to a beehive. According to police records, the caller stated there was a huge beehive outside at the location, which was not private property. The RP stated the bees were everywhere and that they were concerned for people who are allergic. The property owner was contacted and was reportedly in the process of removing the bees. 12:02 p.m. Diandre Lamont Lopez, 45, Santa Ana, was arrested on a warrant for driving with a suspended license due to a DUI. Bail was set at $10,000. 6:11 a.m. Douglas Henry Smith, 65, Laguna Niguel, was arrested on a warrant for making criminal threats. Bail was set at $15,000. 1:59 a.m. A 51-year-old Anaheim man was arrested on suspicion of DUI. Bail was set at $2,500. It seems that throngs of people are trying to get to our goats in Laguna Beach. Stu News heard from one source that they had seen over 40 people at one time up on the trails watching the goats, and also that people were trying to feed and touch them. Recent police records substantiate these reports. Personnel took action, arrived on scene, and escorted the subjects away from the goats. Merely 48 hours later, on Tuesday, April 2, at 7:48 p.m., again at Dartmoor Street and Dunnegan Drive, LBPD received additional accounts of the goats being interfered with. According to police records, a caller advised LBPD about an incident that had occurred earlier in the day at 5:50 p.m. The RP and her daughter were looking at the goats when she noticed “four male juvies messing with them.” The boys reportedly scattered after they saw her. The caller also advised that when she went back later, there was a baby goat that appeared sick. Having worked with goats before, she picked up the goat and wanted to take it to the hospital in the canyon. At one point during her reported do-good rescue efforts, the RP was carrying the goat, when she encountered the City’s goat herder. According to Jim Beres, LBPD Civilian Services Administrator, Animal Services Officers responded to both calls and no action was taken. Animal Services advises residents and visitors not to approach the goats, no matter their intention. Beres advised, “The fire goats are there for a specific reason, to eat the overgrown weeds and vegetation that could develop into a fire hazard. People should leave the goats alone, they are working goats. The grazing goats are on the job and don’t appreciate harassment at the workplace. It’s not a petting zoo. According to a FEMA report, “Laguna Beach has been using goats as part of its fuel reduction and vegetation management program since the early 1990s. The program was expanded after a wildfire burned across 14,000 acres, destroying or damaging 441 homes in the beach community in 1993. Because of the climate, types of natural vegetation, and expansive wildlands in Southern California, including wildlands that reach into the city, there is an ongoing risk of wildfires. Fully aware of the risk, Laguna Beach Fire Department is very proactive in vegetation management. One of the best ways to control wildfires is to control the amount of fuel available to feed the flames. These areas can be difficult to reach by most vegetation management equipment due to the nature of the terrain – rocks, canyons, and steep inclines. The introduction of goat herds in these areas has proven to be an ideal solution to the problem.